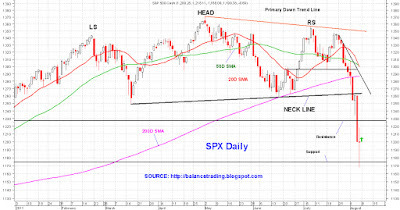 ..... Balance Trading .....: S&P Downgrade Already Baked In? S&P downgrade is baked in already in my opinion. Let's not forget that those S&P analysts who downgraded US debts on Friday are the same crooks who gave "AAA" rating to every sub-prime mortgage backed security that came across their desks for years. They kept that "AAA" rating on nearly all mortgage backed securities until about a month before the whole "sub-prime meltdown". Now all of sudden we should care about what they say about US debts?! These guys have no credibility, whatsoever. Big Money owns these guys and tells them what to do and what to say. I'm certain that Big Money knew for days if not weeks about this downgrade. Big Money sold on the rumor for weeks and Big Money very likely is going to buy on the news now. After reaching multiyear highs in late April to early May, indices sold off until mid to late June off due to seasonality and typical bull market profit taking. Then they started a new rally to challenge their new highs until it was cut short by the totally manufactured debt ceiling crisis. Market sold off as "Tea Baggers Got Big Dicks" show went on which finally forced an idiotic agreement on everyone. An agreement that cuts government spending exactly at the wrong time which will bring about another recession or possibly another depression as similar actions back in 1930 brought on the Great Depression. The decline in the indices over the course of last two weeks is Market's reaction to that idiotic agreement as I warned you about in my post of July 24. Technically, the likelihood of a crash on Monday is slim because where we closed on indices on Friday and more importantly how small caps were being bought as indices were doing their gyrations. It's probable that panic selling hits markets early this week and push prices lower, but I fully expect to see a substantially higher weekly close for all major indices by the end of the week (Friday Close). 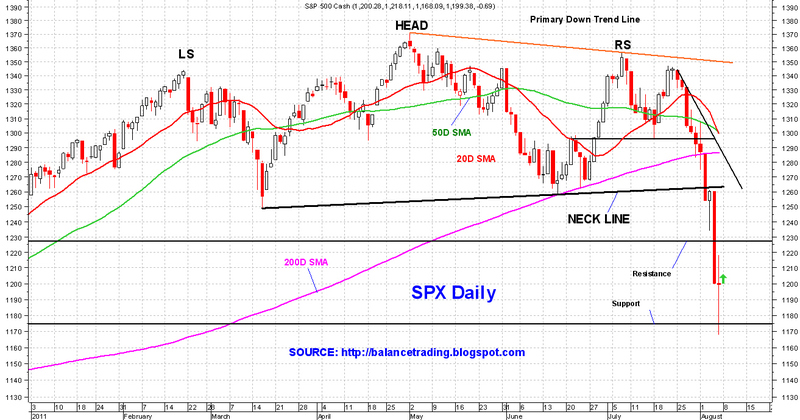 Longer term, I believe SPX very likely rallies to test the Neckline sometime in late August. After that, Market is going to look for QE-III in the States and something similar in Europe. Without another round of Global QE all economies and all markets are doomed.